Today is my brother’s birthday. Happy birthday, Dor! I’ve been using this recipe for ages now, and it’s simply one of the best out there. It’s tender and fudgy and has a deep chocolate flavor, plus it stays moist for days. But the best part? It’s both easy and quick to put together. All it takes is mixing dry ingredients in one bowl, the wet ingredients in another bowl, and then combining them together. No mixer needed! How can you not love a recipe that’s that simple (and that delicious)? Now, about the frosting. I’ll be honest: I have more than one frosting recipe I love, all of them for different occasions. 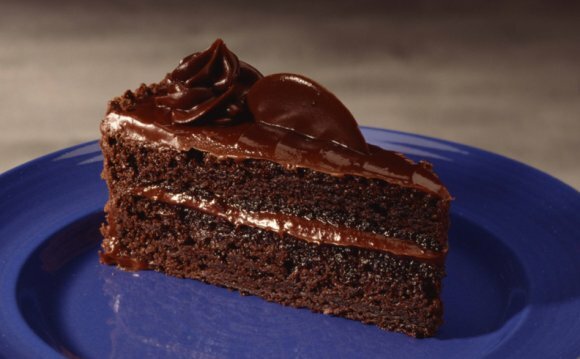 For example, I would use a rich chocolate ganache if I want a really scrumptious and rich cake. But today, I decided to go with a classic one that reminds me of a nostalgic celebration cake. Read more about the frosting here. If you‘re making a 9-inch round cake and you only have one pan, you can simply bake it in the single pan. Once the cake has cooled, cut it in half lengthwise (it’ll be easier to cut if placed in the fridge and used cold) and use these 2 layers to proceed with the rest of the recipe. Baking time will be longer – about an hour. If you’re making a 6-inch cake, you can use 2 pans instead of 4 (don’t bake it in just 1 pan! ), then cut each of the cakes in half. This will ultimately yield 4 layers. You can use the frosting just between the layers, or over the entire cake, but don’t stress too much about making sure it’s perfect. This cake will be delicious no matter how you choose to frost it! Preheat oven to 350F/180C. Generously butter 2 9-inch or 4 6-inch cake pans (refer to above post if you only have a single pan) and dust with cocoa powder, tapping the ramekins slightly to remove any excess. In a medium bowl, mix together eggs, oil, vanilla, buttermilk, and water. Whisk until smooth. Add egg mixture into flour mixture and mix until smooth. Don’t overbeat – batter will be lumpy at first, but mix gently and eventually stir with a whisk just until smooth. Batter will be very thin. Scrape batter into prepared pans. Bake cakes for about 20-25 minutes, or until a skewer inserted into the center comes out clean or with just a few moist crumbs. Allow to cool for 10 minutes in the pan before unmolding, then let cake cool completely on a wire rack. Really moist triple layer chocolate cake recipe. No bake!